The next generation of scopes with uncompromising quality. Get all-around versatility from the Leica 1.5-10x42 Magnus i Riflescope with Illuminated L-CD i Reticle. 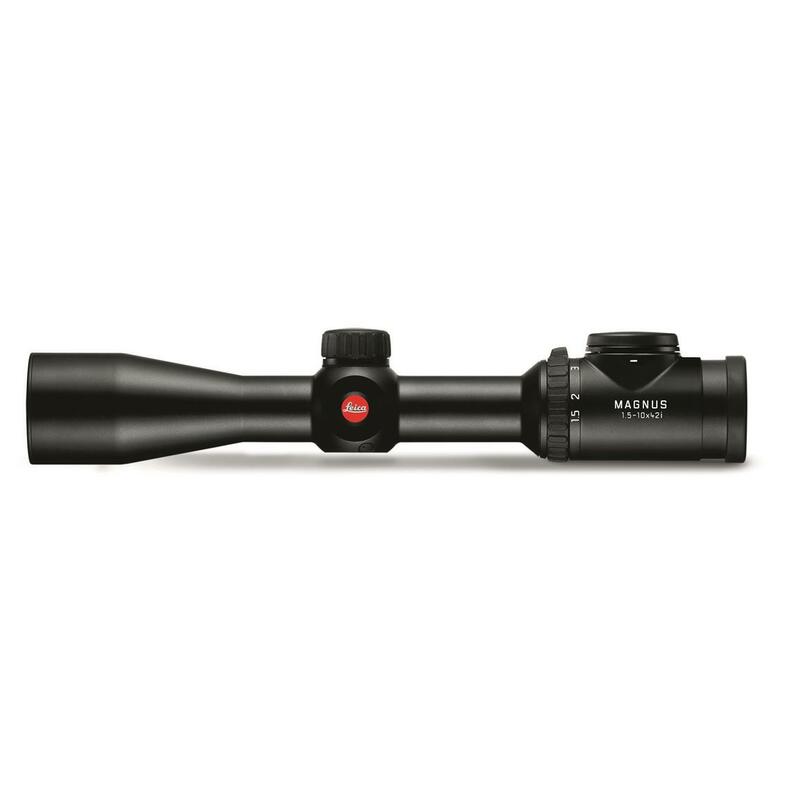 Whether you prefer driven hunts, an elevated stand, or ground blind, this riflescope provides you with the maximum contrast, focusing and field of view for safe target identification in every situation. The Leica 1.5-10x42 Magnus i Riflescope with Illuminated L-CD i Reticle will impress you with the proven features Leica has always been known for: high-performance optics, robust mechanics and intuitive operation. Every Magnus i model features turret scale zeroing without tools for convenient sighting-in and optimized reticle coverage. The selectable day/night illumination now offers additional protection against any accidental resetting. Leica uses innovative projection technology for extremely sharp illuminated reticles that are free of distracting excess illumination. The new L-CD i reticle uses a dot and concentric ring that balances being fine enough so that it covers only the target but is also clearly visible. A sensitive control button lets you choose how dim or bright you wish the illumination to be. Leica uses "phase gratings" technology to etch nano structures into the glass to shape the light with high efficiency. Safety matters and Leica scopes deliver through multilayer plasma lens coatings to achieve a natural color fidelity and outstanding light transmission to provide maximum light-gathering power at low magnification. Paired with the superior glass, stray-light suppression and extreme lens shapes, this scope creates fantastic contrast for precise detailed images even in poor light.